As a female, concealed carry can bring a host of challenges. On one hand, women’s clothing tends to be more form fitting than men’s, which presents an issue of where to carry your weapon. Many women find it difficult to carry a gun in their pockets because it is very noticeable, bulky, tight, and overall uncomfortable. Oftentimes, whether by career or choice, women wear dresses and skirts without belt loops, which can cause additional issues, as well as being made of unsupportive material that cannot maintain the weight of the gun. If you find yourself resonating with the burdens of carrying a weapon comfortably, a holster may be an excellent option. With so many options on the market, we’ll explore the different types of holsters and how they can make carrying a concealed weapon more manageable. When you’re considering a holster, you’ll always want to consider the type of gun you have. When picking out a gun it’s easy to go for aesthetics, but try to keep in mind the size of the gun — you ultimately don’t want to end up with something too big or too for your body. A gun that fits comfortably is always key. Once you find a gun that fits with your body and size, picking out a holster is not as daunting. So, why wear a holster? A holster provides the wearer with a consistent, accessible location for a gun. A holster is encases the gun and keeps it from wear and tear, makes concealed carry more comfortable, and can provide additional safety from unintended firing by covering the trigger area. Companies will generally produce a holster that accompanies the model of gun you have, but if you’re looking for something more accommodating to your lifestyle, you have many options! Mid-section holster – A mid-section holster may also be referred to as a belly band or corset. This type of holster fits around your midsection and is adjustable for the perfect fit. They can be as unassuming as elastic and flesh colored, to ornate and lacy. These can be comfortably worn under dress pants, yoga pants, skirts and dresses, and come with additional compartments. Ready-to-wear holsters – These clothing pieces already have the holster built into them, and can be found in tanks tops or spandex shorts that you can wear under clothing. These pieces will fit snugly to the body and are able to support the weight of the gun, while remaining hidden under clothing. Specialty holsters – These holsters are being built into bras, sports bras, and purses. The holsters in bras are fitted aligning the sternum and fit between the breasts and rib cage, while in the sports bra, it’s generally on the side and under an arm. The purse will have a side compartment — usually lockable — where the gun easily fits. 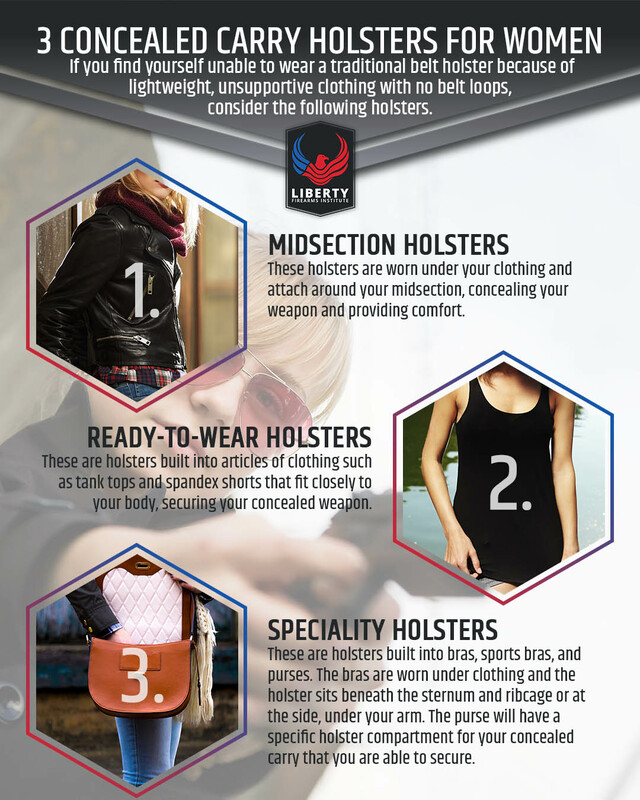 Choosing the right holster may require trying on a couple to see which fits best.The holsters listed above offer a solution to women who wear unsupportive clothing or clothing with no belt loops, but because the gun is under layers of clothing, it can make quick access to the gun an issue. Research your concealed carry options and consider situations where you may have to use your gun, and always choose wisely and choose safely. For concealed carry classes and women specific concealed carry classes, check out Liberty Firearms Institute today!